MacXDVD is pleased to unveil the latest version of its time-proved MacX Video Converter Pro, which perfects itself by furnishing immaculately enhanced YouTube downloading feature, making video downloading smoother and more stable. Simultaneously, the latest version is given away from now to April 7, 2013 to celebrate the soon-to-come Easter holiday. MacXDVD, dedicated to developing world-class multimedia software for personal and public entertainment, today updates its first-rank product MacX Video Converter Pro with an enhanced YouTube downloading ability, which means with this video converting software in hands, Mac users can enjoy a smoother and more barrier-free YouTube downloading and converting experience on Mac computer. It’s worth mentioning all customers are enabled unconditionally to get the latest version of this Mac video converter software for free since MacXDVD is settling 2013 Easter giveaway and promo campaign to celebrate the resurgent season that is full of animation. The update of this video converter for Mac aims at dealing with the changes of download thwarting mode that brings about failure in downloading YouTube videos. By optimizing the core technology, this upgraded software lubricates the video downloading and converting process peerlessly. "YouTube videos are a vital part of our everyday lives, and we know how important for YouTube-savvy users to be able to download videos from YouTube," said Jack Han, the CEO of MacXDVD Software, "Ever since the reported YouTube downloading issue from Mac users, we hope to put an end to the constantly fretful experience and immediately improves our video converter performance to ensure our customers can continue to enjoy downloading and converting YouTube videos on Mac flawlessly without forcing them to compromise on quality." MacX Video Converter Pro brings joy to Mac users by providing an all-in-one SD and HD video converting solution, which supports to convert almost all videos on Mac, ranging from MP4, MOV, FLV, AVI, WMV to MKV, MOD, AVCHD, M2TS, etc. No matter general videos, videos downloaded from website, grabbed from HDTV, or recorded by HD camcorder, this omnipotent Mac video converting software makes them playable on nearly all media players like iPhone, iPad, iPod, Samsung, PSP, HTC, etc and addresses Mac customers’ up-to-date needs in watching these videos on even today's new breed of portable entertainment devices such as iPhone 5, iPad Mini, Samsung Galaxy Note 2.0, and many more. Apart from terrific video conversion function, MacX Video Converter Pro also deserves spotlight from the public in terms of intuitive interface, which makes video conversion happen like a wizard with no difficult. 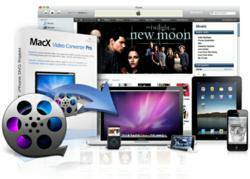 What’s more, quality and conversion speed are not issues at all for this Mac video converter software. Exclusively for the Mac OS platform, MacX Video Converter Pro requires Mac OS X 10.5 or higher (including the latest Mac OS X 10.8 Mountain Lion) and is generally priced at only $34.95 for single-user license. Particularly, this program is now given away to cheer up the upcoming Easter holiday.